Diamonds. They’re one of the hardest materials on earth. They come in all shapes, colors, and qualities. They are damn sparkly. And we’re told they’re very valuable. While diamonds will always have a market value, (okay, maybe not after the zombie apocalypse, but even then I’m not so sure) I believe we only get the true value of them if we enjoy them. Which means wearing them. Which means that you’re not getting any value out of that ugly 1970’s brooch in the bottom of your jewelry drawer from your great aunt (God rest her soul). 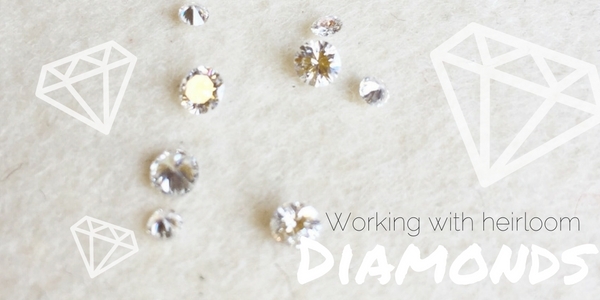 Let’s get some real value out of those heirloom diamonds and gems. 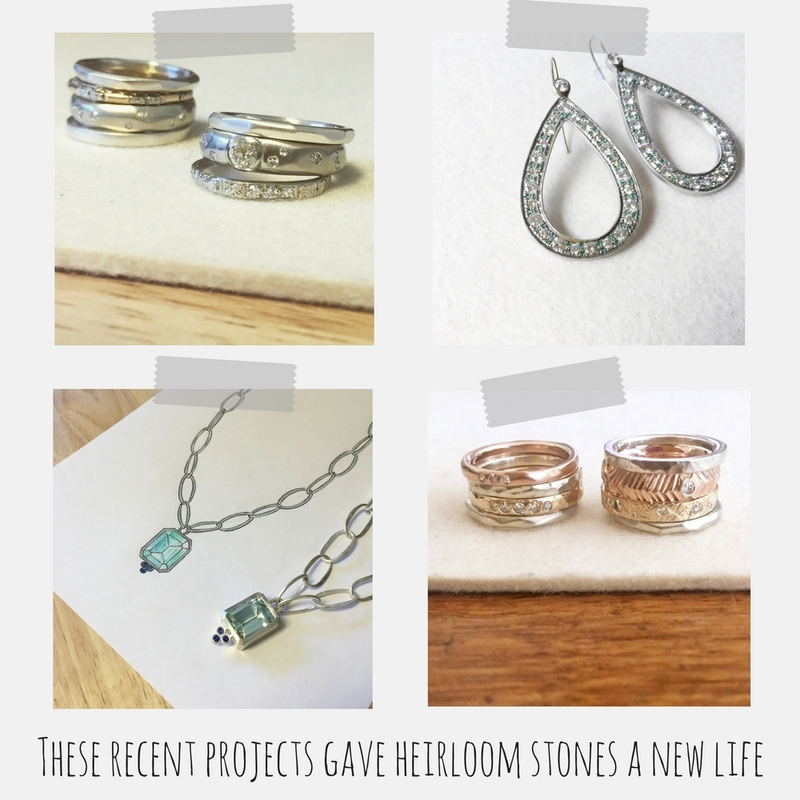 I get asked a lot if I can work with heirloom diamonds or gemstones, and the answer is yes, yes, ohmygod YES! A lot of the work I’ve been doing lately is reimagining new settings for old gemstones and diamonds. I remove the gems, recycle the metal, and reset the stones into something that will be worn and loved. What I love about this process is that it’s true recycling-no new diamonds are being ripped from the earth or contributing to unethical and inhumane trade practices. AND you retain all the wonderful sentimental value of something that belonged to a loved one. It’s a win/win. The metal that the stones came out of can often be refined and the proceeds can offset the cost of your new jewelry- bonus! There is always a small risk when working with heirloom stones that a previously unseen crack or chip will emerge. The likelihood is very low for diamonds which are incredibly hard, but can be higher for more delicate stones like emeralds or opals. We’ll talk about the risk together before we remove the stones. Do you have a pile of old jewelry you’ll never wear? The first step is to start with a free consultation. We’ll look at what you’ve got and start working on a design for something you’ll truly love to wear. Dust off those little sparklers! Let’s bring them out into the world!